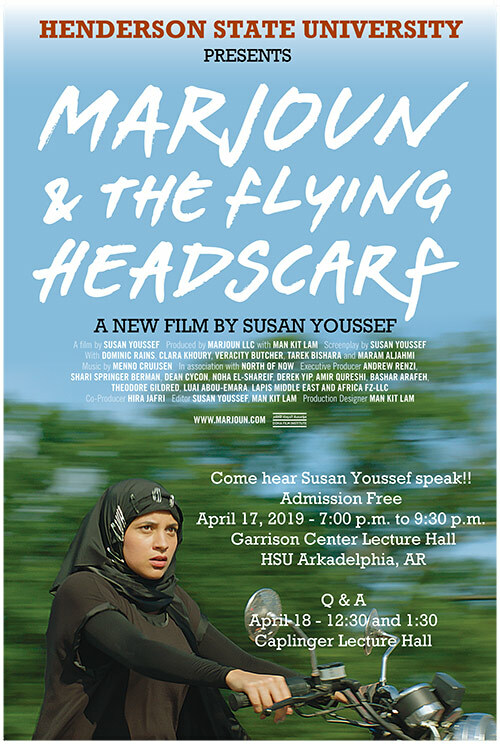 Film director Susan Youssef will return to Henderson State University April 17 to present the Arkansas premier of her latest film, Marjoun and the Flying Headscarf. Youssef first visited the campus in 2012 and premiered her film Habibi. She has since been recognized globally as one of 25 Women Directors and is a directing fellow in Fox Studios’ Global Directors Initiative. The film will begin at 7 p.m. in the Garrison Center Lecture Hall, with doors opening at 6:30 p.m. There is no reserved seating, but attendees must obtain a ticket at bit.ly/2WMGgSt . The public is invited. Marjoun and the Flying Headscarf is set in 2006 in the aftermath of 9/11, the Second Intifada, and Iraq War. It captures the shifts in Arab and Muslim lives through three women in Marjoun’s household at a time when young Muslim women are choosing the hijab independently of their familial traditions to find meaning and strength in the own choices. For more information about the event, contact Dr. Malcolm Rigsby at rigsbym@hsu.edu or 870-230-5143. Learn more about Marjoun and Youssef at facebook.com/marjounandtheflyingheadscarf.